Jonathan Ching opens his latest solo exhibition ‘The Shapes of Hills’ at Tin-aw Art Gallery on 11 November 2017, Saturday at 6pm. In his latest exhibition titled the Shapes of Hills, Jonathan Ching turns his attention to images of the bulky mass of machine equipment enveloped and bound by tarpaulin and rope, scenes that he has harvested from his immediate surroundings. He then translates these images into multi-panel paintings, rendering his subject matter as seen from different viewpoints and angles. For Ching, the forms that that result from such amalgamations reminds him of rugged hills and mountains, giving new meaning to the term “urban landscape”. 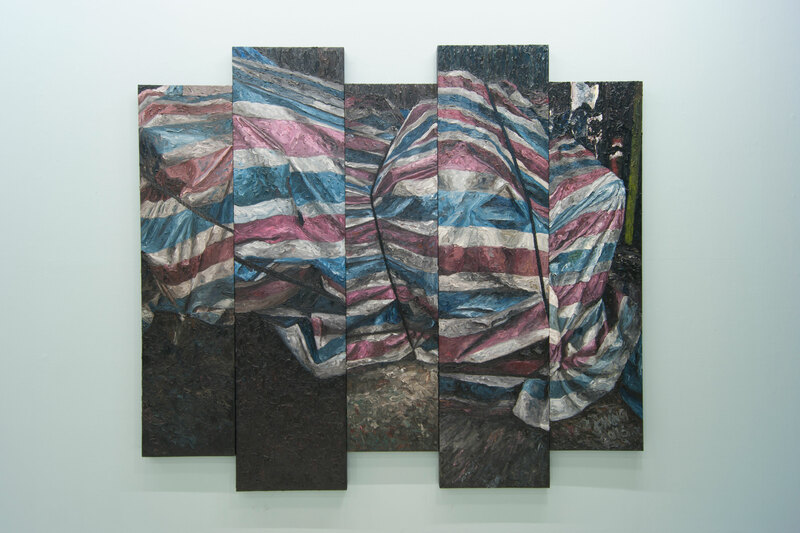 Indeed, the juxtaposition of the lines created by the edges of the multiple panel with the organic forms created by the creases, folds and bumps of the tarpaulin calls to mind the image of a satellite view of some random terrain. Through mastery of technique and composition, he elevates these rather mundane and dismissible objects into images worthy of contemplation; and by presenting them in a large scale, the artist multiplies this effect exponentially. The Shapes of Hills will run from 11 November 2017 to 2 December 2017 at Tin-aw Art Gallery. The process by which artist Jonathan Ching forms his visual creations is more intuitive than calculated. He usually starts not with a concrete theme, instead, he lets sceneries and scenarios that have piqued his interest or have resonated with his thoughts at the moment guide him in his image-making. These images become, in essence, markers of where the artist has been or what he has experienced, visual souvenirs that he has absorbed with his eyes and his mind, and after having reflected upon he transmutes onto the canvas. This, then, transforms the canvas into something akin to a page from a personal journal in which the artist records his collected images together with his musings about them though not through words but by his distinctive thick brushwork and carefully built up layers of paint. 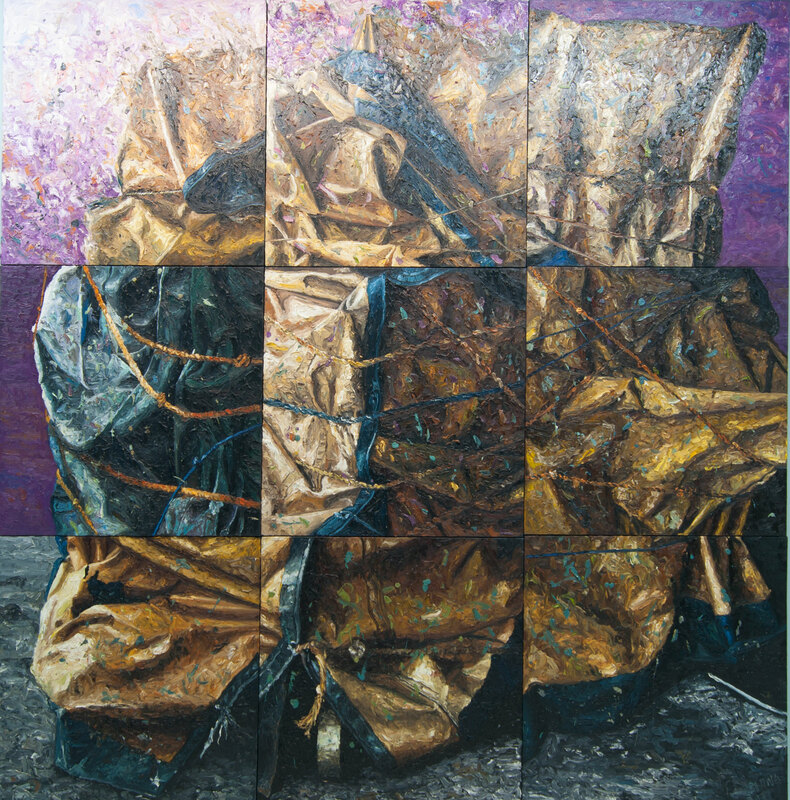 In his latest exhibition titled The Shapes of Hills, the artist’s creative process has led him to a fascination with the images of bulky mass of machine equipment enveloped and bound by tarpaulin and rope, a sight not uncommon in the streets of Manila where the artist resides. For Ching, the forms that result from such amalgamations reminds him of rugged hills and mountains, giving new meaning to the term “urban landscape”. Through mastery of technique and composition, he elevates these rather mundane and dismissible objects into images worthy of contemplation; and by presenting them in large scale the artist multiplies this effect exponentially. He has explored this interest with canopy-engulfed structures before in his previous exhibit La Strada. In this current incarnation of the exploration, however, he takes the process further by depicting the mass of the objects from different viewpoints and rendering them in multiple panels. In the painting titled Stripes, for example, the artist seemingly played on how close the is subject viewed, much like the zoom feature of a camera. The varied sizes of the panels help emphasize the variations as well as making the work both dynamic and orderly at the same time. While in the work Lucky Rainbow, the variations in perspective was made evident by the quartered image of a dog. 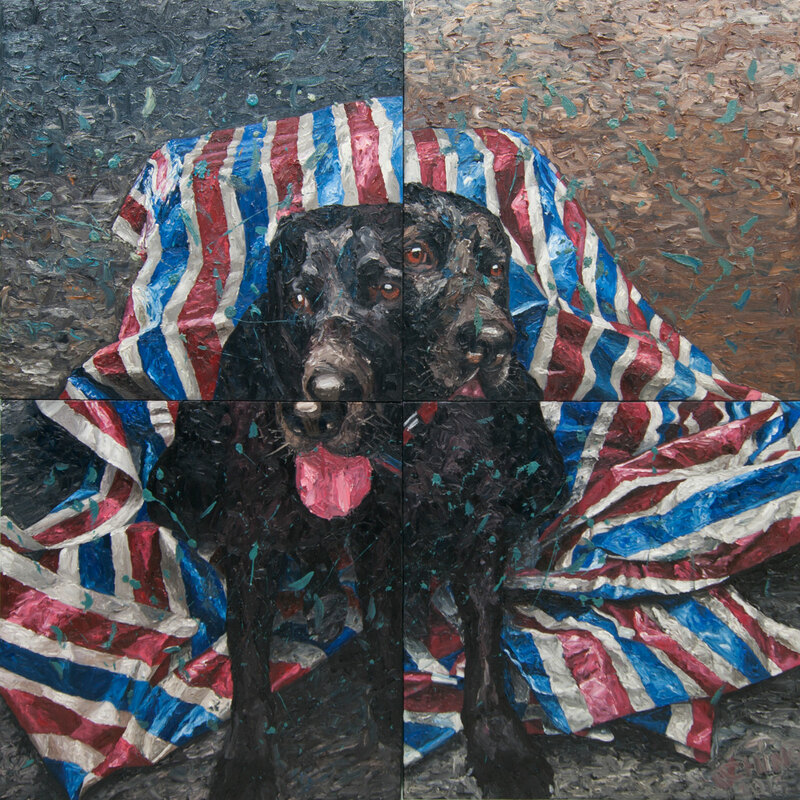 The two works echo each other in terms of the similarity of the pattern of the tarpaulin depicted in them. The centerpiece is a work that shares the title of the exhibition. The Shapes of Hills is the largest among the included artworks and understandably, the work that best reflects the artist’s observation that the subjects look like hills and mountains. It is composed of nine different panels. The edges where the panels meet are reminiscent of grid lines on a map, the ropes resemble roadways, and indeed the creases, folds and bumps of the tarpaulin reinforces the likeness of the whole image to a satellite view of some random terrain. 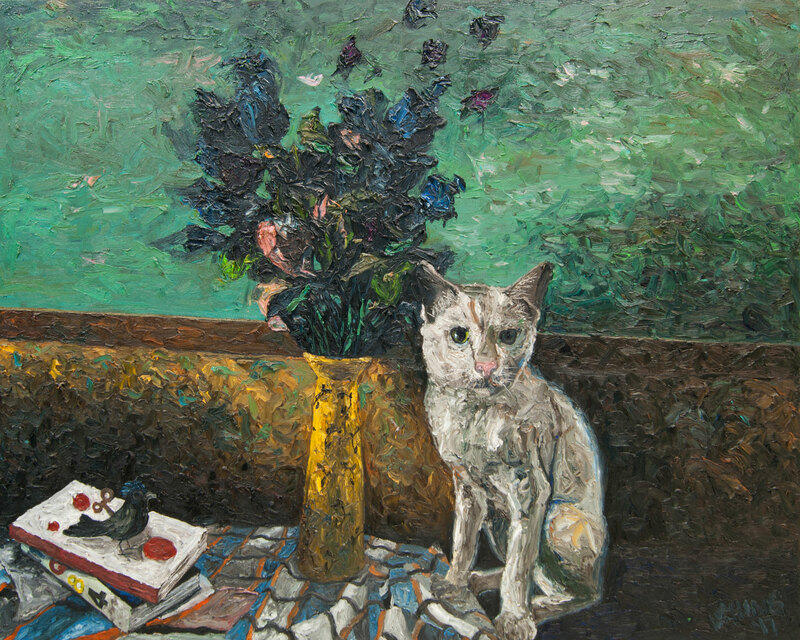 A curious addition to the ensemble of artworks is the piece titled Murakami’s Missing Cat (After Dex Fernandez), a still-life painting dominated by an image of a cat staring directly at the viewer. Its title wittily alludes to Haruki Murakami, the author of 1Q84, a book depicted in the painting and his fondness for cats. The painting is unique among the works included in the exhibition in that it deviates from the multi-panel format of the other three works and it also does away with the method of representing the subject matter from varied perspectives. Visually it relates to the other pieces by virtue of the pattern of the table cloth depicted in it (and also, by the artist’s depiction of an animal which he also does only one other painting, Lucky Rainbow) but conceptually, the link is somewhat held back by the artist as if asking the viewer to discover it for themselves, like a riddle that is yet to be solved. Perhaps it is tucked away between the pages of Murakami’s book. Perhaps the link is the metaphorical “missing cat”, the cat is not missing for its image is laid bare on the surface of the canvas but one has to be privy to the story beyond the image in order to fully appreciate its wit. Experiencing the exhibition in its entirety, it appears that there is no rigid and strict theme in which these works can be definitively categorized, instead they relate to one another in a series of small connections. Probably because of these small, at times very subtle connections that when a logical assumption seems to be within reach it suddenly eludes the viewer and one is left with the purely visual appreciation of the artworks. In retrospect, this may as well be a way the artist shares with the audience the organic process in which the he operates.